There is nothing that can put you in the holiday mood like a Christmas tree. Putting it up in your living room and decorating it is a ritual that brings the family together and marks the true beginning of the season. Heading down to the local hardware store or garden center to choose the perfect tree, then sheltering in the car with some hot cider is a memory many people cherish from their childhood. For businesses, a real tree is an unusual feature and can really set a holiday tone when you’re decorating for the holiday season. An evergreen out front or in the office can make workers and customers happier, and remind them of their own childhoods. But, as the kids get older and so do the parents, going out into the cold starts to seem like less fun. Dealing with falling needles, which seemed worth it when your kids were young, becomes a hassle you’d just as soon avoid. A real tree may not be an option for a business, expensive or even impossible. Artificial trees are a great alternative that make life easier, eliminating the need to water and care for a tree, as well as keeping pine sap and falling needles off your carpets and hands. There is a huge range of artificial trees, however. And if you’re looking online and can’t inspect one in person, judging the quality of a tree can be tough. 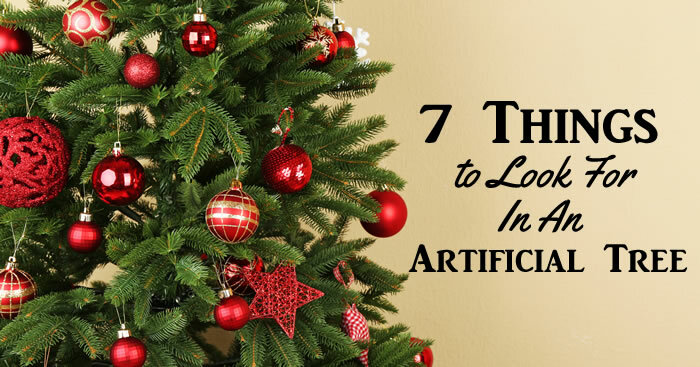 There are a few things to look at when it comes to artificial trees that can be a good guide. It’s also important to choose the tree that is right for you. Consider your space and needs when choosing an artificial Christmas tree. 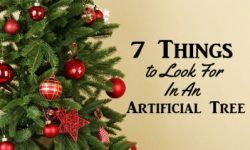 Artificial trees come in all sizes, from the big trees you see in the local shopping mall to the little plastic ones on the counter at your drug store. When choosing an artificial tree, consider how much space you have. Measuring the space you want to use is a good thing to do before you choose your tree. Set up is another important thing to consider. A bigger tree is harder to move, store, and manage. It will also take more time to set up and decorate. The height is as important as the width, and make sure you look at the collapsed size as well. Also, keep in mind the space you have to move the tree though on its way to its final spot, and make sure you can get the tree into position. This is an aesthetic concern, rather than a practical one. Most artificial trees attempt to mimic some actual evergreen tree in shape and appearance. Christmas trees are beautiful, but just as you like to match the decorations on your tree to the other decorations around your house or office, you want to match the appearance of your tree to your over all decorating scheme. This is something that an artificial tree has over a real one. While you can pick and choose when selecting a real tree, there comes a point when you just have to take what you get. With an artificial tree, there are a wide range of specific choices that you can match with your decorating ideas. Some will be big and fluffy, and others will be thinner and straight. Many artificial trees will come with lights already arranged and attached. You can find trees with all different arrangements and number of lights. These will be fixed, and you won’t be able to take them off or move them, so be sure it’s an arrangement you’ll be happy with for a while. However, a pre-lit tree will be much easier to set up. Artificial Christmas trees can also come pre-decorated in a few different ways. It can be accented, meaning it can come with artificial pine cones and berries already attached. These additions can make for some nice decorations and small touches, but they are usually fixed and cannot be removed as well. Flocked trees have been painted to appear as if covered with snow or frost. The quality of this decoration varies, and can often appear kitchsy. However, if done well it can be very pretty. Branches on artificial trees are usually of one of two types: hinged or hooked. Hinged branches are permanently attached to the tree, and can be folded when the tree is taken down for storage. Hooked branches are not permanently attached to the trunk, and instead are hooked on when set up and removed when taken down. In general, hinged branches are found on higher quality trees. These make it much easier to put up and take down. Also, you are less likely to loose pieces when everything is attached. Hook in branches generally are much more fiddly and take longer to put together. Trees with hook in branches can also not be pre-lit. However, they are usually less expensive. Artificial trees, and specifically the needles, are usually made from one of two materials: PVC or PE (polyethylene). They each have benefits, and choosing one over the other is going to depend on what you’re looking for. For example, PVC trees’ color will not fade, and so will always remain green. PVC is also fire resistant, making it significantly safer than a real tree, or even one made from PE. However, PVC needles are usually wired to branches, which can make the tree more obviously fake. Trees made from PE will have needles that are formed integral with the tree, and might be better sculpted to give them a more authentic look. If realism is what you’re shooting for, a PE tree might be a better choice. Some trees may use both materials to give an even more authentic and varied look to their needles. The number of ‘attached tips’ is something that will often be cited in artificial tree descriptions, though it is not always clear what that number measures. It is actually one of the primary indicators of the quality of an artificial tree. When looking at the description, he higher the number of tips, generally the higher the quality of the tree. This number measures how many actual branch tips there are on the tree. A higher quality tree will have a higher number because the more tips, the fuller a look the tree will have. Fewer tips will make it easier to tell when a tree is artificial. In particular, if you can see through to the center pole of the artificial tree, you should probably avoid it. The exception to this rule is when the tree has a faux ‘trunk,’ with artificial bark designed to give it an added measure of realism. These trees might have fewer tips, and deliberately expose the trunk. The quality of the stand may seem like a minor concern, but practically speaking it can make a big difference, both in the quality of the tree and in its lifespan. You definitely do not want the tree to fall over, breaking all your expensive decorations, because of the cheap plastic stand that came with the tree. A metal stand and center pole are both preferable to plastic. The tree will be sturdier and stronger with metal at its core. If the tree does not come with an attached stand at all, consider another option. Trees with integral stands are easier to manage and stand up, and are overall sturdier and stronger. Artificial trees are increasingly popular, as they last longer and are much easier to deal with. Depending on the artificial tree you choose, they can also be more ecologically responsible. Your artificial tree can be with you for years to come, however, so it is worth it to do some research and choose a tree that is just right for you.